Add StarCraft II to the list of increasingly sophisticated games at which well-trained AIs can smash fallible, meat-fingered humans to chunky bits. 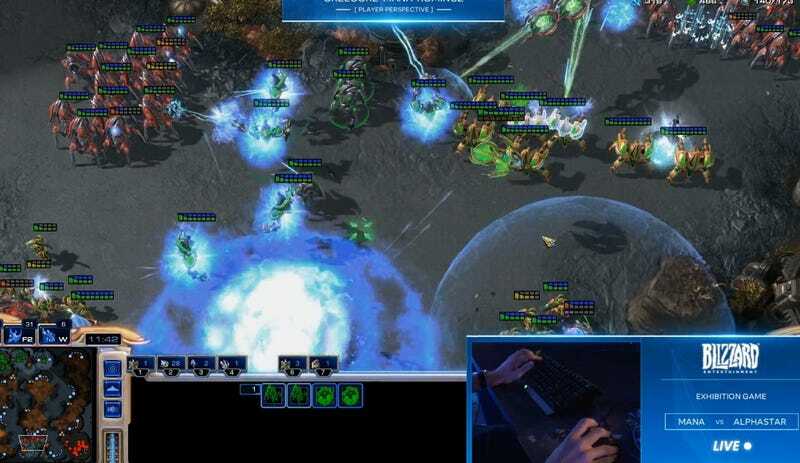 Google’s DeepMind AI beat two professional players of Blizzard’s StarCraft in two multi-game series that happened in December, the companies jointly announced today. The AI, which the DeepMind team has named “AlphaStar,” beat Team Liquid’s Grzegorz “MaNa” Komincz and Dario “TLO” Wünsch five games to nothing in two separate five-game series. During a stream showing off the results of those games today, Wünsch said he’d seen some footage of AlphaStar playing, and even though he was gonna be using his off-race, Protoss, he felt “extremely confident” going in. However, he was quickly met with different barrages of unconventional strategies in each game, making it almost impossible for him to get into a rhythm and figure out how to read his foe. Komincz, a Protoss expert, fell in similar fashion in his series, albeit against a version of the AI that had already learned from its games against Wünsch, and as a result played with a more human-like cadence than before. Turns out, the pros got whooped in part because they were actually up against five different “agents,” or AI competitors that were trained with their own learning objectives. So basically, it was like playing a different person each game. While the AI agents’ foundation was a neural network based on replays of human StarCraft II matches, that initial agent was then split into a multitude of data-hungry-hungry hippos that played against each other in DeepMind’s “AlphaStar League.” Over the week that the “league” ran, the various AlphaStar agents absorbed 200 of your human years’ worth of StarCraft II matches. AlphaStar had other, stranger upper hands, as well, but not the ones you might expect. You’d figure, for instance, that an AI would handily beat a human in terms of reaction time and actions-per-minute, a measure of how many clicks and key presses players perform every 60 seconds. But in fact, AlphaStar’s APM averaged out to 280, which the DeepMind team described as “significantly lower than the professional players.” Its delay between observation and action was 350 milliseconds on average, also lower than the pros. 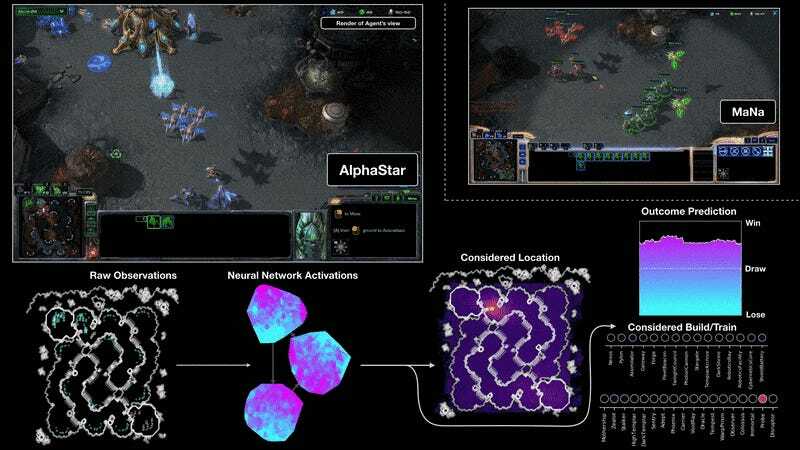 AlphaStar also “sees” StarCraft differently than human players, with an interface that basically functions as a top-down view of the whole map, rather than one that needs to be zoomed-in on at various points. But that apparently still led to human-like actions. “Human players must explicitly manage an ‘economy of attention’ to decide where to focus the camera,” said the DeepMind team. “However, analysis of AlphaStar’s games suggests that it manages an implicit focus of attention. On average, agents ‘switched context’ about 30 times per minute,” the team wrote, which was similar to Komincz’s and Wünsch’s behaviors. During today’s stream, Komincz actually managed to win a one-off exhibition match against AlphaStar, but it was a new version utilizing an entirely new interface based on the way humans interact with the in-game camera. Though the DeepMind team described it as “almost as strong as the raw interface,” it had been trained for just seven days and hadn’t faced any pros. Still, that’s got to be a feather in Komincz’s cap at this point.